This is a list of art works which are related to madness or insanity or lunacy. If you are presenting a unit on mental illness, these would offer interesting counterpoints. Eakins, Thomas â€œRetrospectionâ€ 1880 Possibly modeled on a sketch of an insane patient in a manuscript belonging to John Kearsley Mitchell that Eakins borrowed around that time. 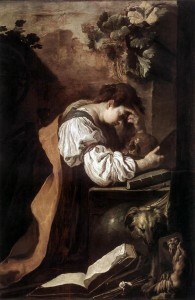 Fetti, Domenico â€œMelancholyâ€ 1622 This is the painting pictured above. Repin, Ilya Yefimovich â€œPoprishchinâ€ 1882 painting of the main character from Nikolai Gogol’s â€œDiary of a Madman.” This work was the first to follow a madman through their diary. 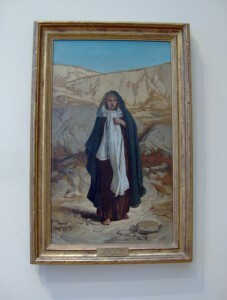 Vedder, Elihu (1836-1923) â€œThe Lost Mindâ€ a woman barefoot in the wilderness. Below is a photo of that painting by peterjr1961 off of flikr. Collection of art through the ages which pictured insanity is on the blog Psychology and Practices for a Better World in Images of Madness.